Yes, I know it’s only December 3, but the clang of sleigh bells is ever louder! Here are my picks of gifts for children that have impressed me as not only lots of fun, but also gifts that will last longer than most. Some are toys I believe are educational, that encourage literacy or that go very well with books, thus extending the versatility of a gift. Others are iPad/iPhone apps, in particular ones that encourage kids to create or think creatively. The majority are books. Why? Because the gift of reading will last a lifetime! When I look for toys to buy as gifts for kids, I’m particular. I want a toy that won’t fall apart in the first five minutes, and one that I can envisage kids playing with for a long time. If it’s a toy that can be used in creative, even educational play, then I’m thrilled. It doesn’t need to be expensive - I’ve bought gifts at garage sales, given home-made bubble mix and bubble wands - but I'm happiest when I find something I believe the young recipient will love. Puppets make great gifts for kids, especially if you can find some to match a well-known tale, a rhyme or to pair with a book. 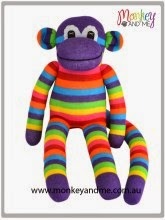 I have some ideas in Use Puppets to Encourage Children’s Literacy. Sometimes publishers will put a plush toy with a book - as with Penguin’s set, Where is the Green Sheep? 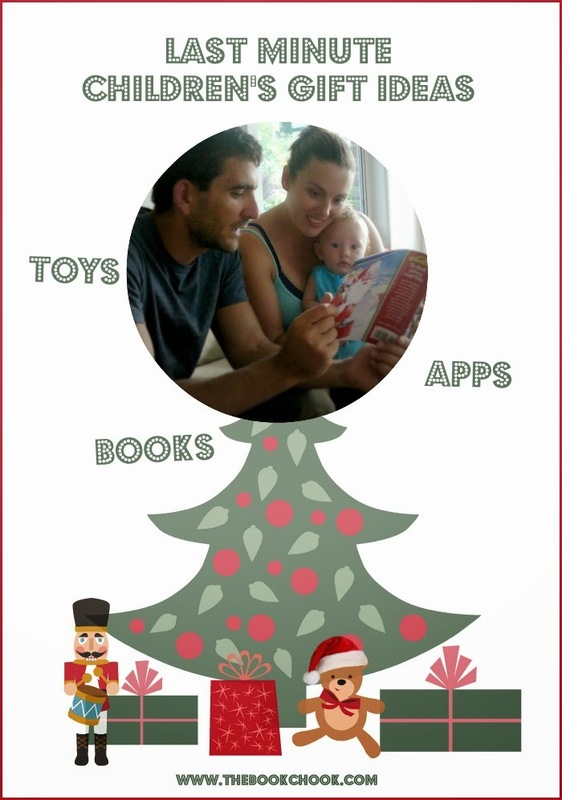 With a little thought, we can make up our own book/toy bundles. Plush animals are readily available - you could pair an elephant with the Little Golden Book, The Saggy Baggy Elephant, or a toy dog with The Poky Little Puppy. The ABC shop has Gruffalo characters and books. Recently, I’ve been trying to buy handmade gifts. I like to support local businesses where possible, and I very much prefer to find something original rather than mass-produced. Here are some toys I’ve found via browsing that are tempting me this year. Games - card, board, and outdoor - are good choices for gifts. I believe there’s lots you can teach children about following rules and fairplay with a standard deck of cards - games like snap, memory and fish don’t need fancy and more expensive packs. Popular games like Snakes and Ladders, Monopoly and Pictionary will all work as a family gift. Outdoor games like skittles, hopscotch, frisbee, and cricket mean everyone is out in the fresh air getting some exercise while they play. One of my favourite toys for encouraging creativity and storytelling in children is story cubes. There’s a commercial product called Rory’s Story Cubes (Fishpond offers them in Australia.) Or you might like to make your own from wooden cubes: See Sixteen Sensational Storytelling Ideas. Melissa Taylor of Imagination Soup has some great toys and activity ideas for storytelling. LEGO: Need I say more? I love what LEGO offers kids. Once you find a new or secondhand LEGO set for your child, check out my Ten Creative and Fun ideas with LEGO. If you’re running late with gift-buying for kids, or don’t have time to make it to a bricks and mortar store, shopping online makes sense. You can be as last minute as you like by using the App Store or Google Play! If, like me, you’re concerned about how much screen time children get, then my suggestion is to choose an app that encourages kids to create, and perhaps links somehow to real-world creation too. The developer of Hat Monkey is Fox and Sheep, the people who made Little Fox Music Box, an app I adore. The exciting thing is that Hat Monkey showcases the art work of Chris Haughton, one of my favourite picture book writer/illustrators. I've reviewed and enthused about A Bit Lost, Oh No George, and Shh! We Have a Plan. Inside you get Haughton’s trademark limited palette and quirky artwork. 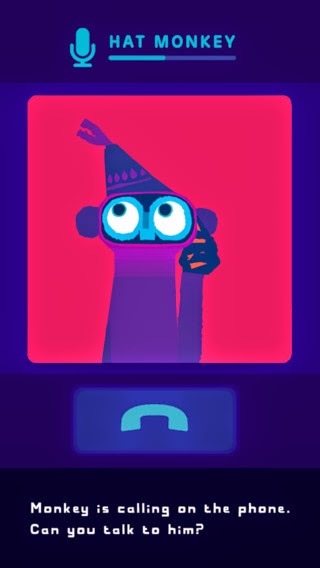 Basically I would call Hat Monkey a digital toy. You don’t end up with a product that kids create; rather they interact with the little monkey - accompany it as it plays saxophone, send it a text message, play hide and seek, imitate the monkey’s dance moves. It’s really cute and lots of fun for preschoolers. Link it to the real world by seeking out Haughton’s picture books mentioned above, or add a sock monkey! Check it out on iTunes Australia; iTunes USA. Here’s a great app for a child you’re also buying DUPLO for. It’s free, available for Android and iOS, and lots of fun. Check it out on GooglePlay and iTunes. Rabbit and Giraffe need to solve problems on their way to Lion’s birthday party. Designed for kids under 5, LEGO DUPLO Zoo is intuitive and also has little animations for kids to watch. There are other free LEGO DUPLO apps, like Train, that sound great, though I haven’t tested them. The apps allow kids to interact with LEGO characters when you’re not in a situation that suits building with physical bricks. Link it to the real world by pairing it with a DUPLO brick set. Just as it’s a fine idea to pair a book gift with a complementary toy, so too is it to pair an app with something that extends the digital experience. Puppet Workshop encourages kids to decorate digital sock puppets with digital objects. It’s simple to use, and means kids can create digital puppets when perhaps real puppet creation isn’t practical. Children will love it if you add value to this app by adding a craft box with real socks, buttons, paper and wool scraps, foil, pipe cleaners, glue, darning needle etc. Check it out on iTunes Australia; iTunes USA. My review is coming early 2015. Similar to wordless picture books, Imagistory encourages children to record themselves making up a story about sequential images. The recorded stories can be listened to again, and shared with others. Link it to the real world by adding a printed wordless picture book, such as The Gift, or Mirror. Check it out on iTunes Australia; iTunes USA. My review is coming 8/12/2014. Older kids who love to draw will really appreciate this app. It might be just the encouragement they need to create a digital journal for their drawing, or provide a quick way to sketch out plans and projects. Check out my review. Link it to the real world by adding a voucher to an Art Supply store or some art materials. Here it is on iTunes Australia; iTunes USA. Books make excellent gifts for kids. Combine a real book with a gift certificate to a book store, so children can choose a book of their own, and you’re respecting them as readers, as well as suggesting they try your choice too. Even though I love what a library card offers us all, especially children, I know it’s crucial for kids to have a bunch of books they own too. Ask any reader and they will tell you that loved books become friends. You’ll also find other great book choices for gifts in Top Book Gifts for Kids, The Book Chook’s Ten Top Picture Books, or by clicking Reviews in the right sidebar. Hug Machine by Scott Campbell, published by Simon and Schuster, 2014. This is such an endearing little character in a charming children’s picture book. Everyone needs hugs and our hero, aka Hug Machine, delivers hugs to all. No one escapes Hug Machine as he problem-solves tricky hugs and re-fuels on pizza. The illustrations are soft watercolour, full of humour. There’s lots of white space on most pages, with a few exciting double page spreads underscoring highlights of the story. The large attractive font appealed to me too. Adults will definitely enjoy this as much as the lucky children they read to. It’s a fact that children instinctively respond to Noni the Pony. Parents, librarians and teachers love Noni too, because they value children's picture books that encourage kids to enjoy books and reading. In this adventure, Noni the Pony, Dave the Dog and Coco the Cat head for the beach. The illustrations are simple, almost child-like, and the story is told in rhyming couplets, perfect for helping little ones memorise the text. There’s humour, excitement and whimsy, so do grab this one for your under 5’s. This children’s picture book comes from an experienced picture book team. Willis knows what tickles children’s funny bones, yet encourages them to think about how they react to gifts. Ross creates memorable characters with deft sketches, and lots of colour and movement. If you’re looking for a book for youngsters that will work as a read-aloud, something that promotes discussion about giving and receiving gifts, and makes both kids and adults laugh aloud, grab Boa’s Bad Birthday. The Zoo Box by Ariel Cohn and Aron Nels Steinke, published by First Second. RRP: $USD17.99 The idea of a secret or mysterious box we’re not supposed to open has long intrigued kids. Erika and Patrick promise they’ll be good, fine, clean their teeth etc. But as soon as Mom and Dad leave, the kids ascend to the attic. Shenanigans ensue, and then they find a box…Suddenly, there are zoo animals everywhere! Young readers will love the wacky goings on, and be intrigued, maybe even a little creeped out by the concept of animals regarding US as their zoo creatures. The bright, colourful illustrations help bring the story to life. Another great introduction to graphic novels for young readers. What Happens Next? by Tull Suwannakit and published by Walker Books Australia, 2014. What Happens Next? is a wonderful tribute to the power of the imagination! Little Ellie prompts Grandma to tell her a story - and that story runs parallel to and intersects with their own adventures. 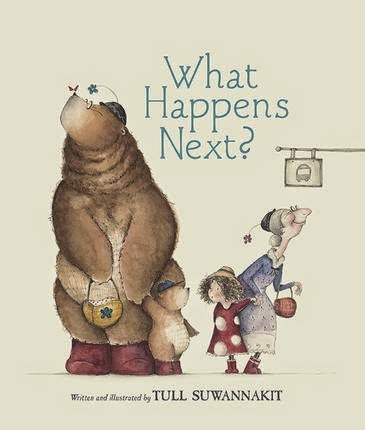 Young readers will enjoy the repeated refrain of “What happens next?" and the amazing characters and events of the story. The illustrations are stunning, simply stunning - full of detail, character and joy. If your kids don’t know Peter Combe’s songs, it’s not too late! Here’s a children’s picture book with an accompanying CD of four of Combe’s songs. Combe wrote great songs for kids. You can see a list here, with links to videos of Combe performing. In this book you’ll find Juicy Juicy Green Grass, The Silly Postman, Tadpole Blues, and Red Says Stop, all accompanied by McDonald’s quirky, colourful illustrations. Following the text while singing lyrics is an excellent way for young readers to develop reading skills, at the same time as having fun. If you’re looking for short chapter books for newly independent readers, you can’t go past the Billie B. Brown series. The format is perfect, with lots of white space and a seriously large font, and several delightful sketches by Aki Fukuoka. Billie is a girl, but her best friend Jack is a boy, making the books appeal to both genders I believe. There are lots of books to choose from in the series, which incidentally has sold over a million copies world-wide, but The Pocket Money Blues is one of my favourites. See them all on Billie B’s own website! May you and your loved ones enjoy a great holiday and festive season this year!